Darebin Information Volunteer Resource Service (DIVRS) is a non-profit organisation that offers a variety of resources which aim to protect and support vulnerable members of the Darebin Community. 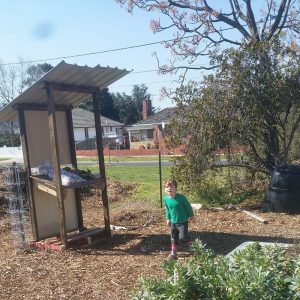 Its Urban Food Program is the practical application of goals in home food growing, community gardening, urban food production and integrated approaches to planning urban food programs. One of DIVRS’ initiatives is the growing and selling of trees and seedlings by volunteers. By purchasing and planting these products, you are supporting DIVRS’ activities to protect and preserve the urban orchard for your community and for future generations and increasing your own food security and those who you share with. Another DIVRS’ initative is The Darebin Fruit Squad, which is a group of trained volunteers who harvest excess fruit from households in Darebin. Once collected, these otherwise wasted resources are made available to members of the community who struggle to access fresh, nutritious food. Since their establishment in 2013, they have collected around 6 tonnes of fruit. Whilst some tree owners simply offer their surplus fruit, others are provided with maintenance services (fertilising, pruning, etc) in return for their surplus fruit. Based on this experience, DFS and DIVRS are now encouraging others localities to develop similar initiatives. To assist with this, they have published a booklet entitled Harvesting the Urban Orchard, whose aim is “to provide practical information, tools and tips that you can use in establishing your own fruit-harvesting project.” Click here to view or download the booklet. Every Monday to Friday between 1pm and 3pm, Diamond Valley FoodShare provides free food to Banyule residents in need of emergency assistance. Around 50,000 meals are given out each year, and around 400 individuals receive meals in any given month. 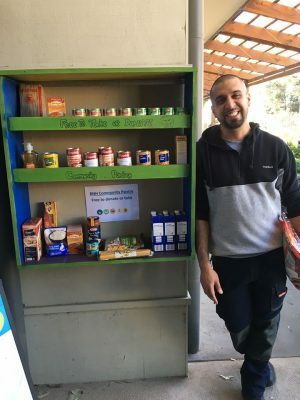 People are referred to the FoodShare after visiting either Diamond Valley Community Information Centre in Greensborough Plaza or Banyule Support & Information Centre (BANSIC) at The Mall, Heidelberg West. Recipients receive parcels containing enough food for three to four day periods. The food parcels can be accessed twice each month. 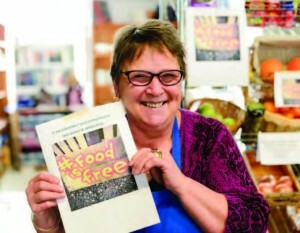 Most of the food comes from the two major Melbourne-wide food relief organisations, namely Foodbank and SecondBite. FoodShare’s volunteers visit Foodbank every fortnight and pick up around 200Kg of fruit and veggies plus some pastries and refrigerated goods. They visit SecondBite every week and pick up around 80Kg of fruit and veggies. They also collect donations from a variety of local sources with the collection points including five local Woolworths supermarkets, Foodworks Ivanhoe and Diamond Village and Diamond Creek IGA supermarkets. Spoilable foods are collected in a refrigerated van which was purchased with the aid of a cash donation from Watsonia RSL. Read an interview from April 2018. FareShare rescues food that would otherwise go to waste and cooks it into free nutritious meals for people in need. In Melbourne, with the help of 900 regular volunteers, it cooks around 5,500 free meals a day (i.e. around 1.3 million meals a year) for charities such as soup vans, homeless shelters, women’s refuges and community food banks. Its rescued food comes from supermarkets, wholesalers, farmers and other businesses. By avoiding food waste, and diverting surplus, edible food from landfill, it also reduces greenhouse gases. Its Melbourne headquarters is in Abbotsford. Fareshare is a charity which relies on donations. Donate now. 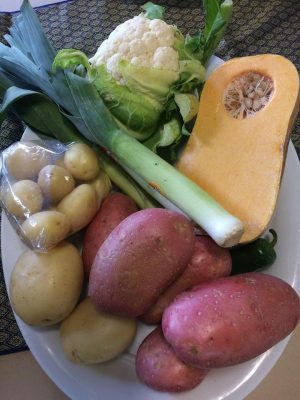 Sourcing enough fresh vegetables to add nutrition to meals is one of FareShare’s biggest challenges. It now has three sites in and around Melbourne where it grows its own vegetables, harvesting around 40 tonnes per year. One of those sites is in Abbotsford, which was previously disused VicTrack land but now grows a range of vegetables on 70 beds tended by volunteers, who are overseen by a Garden Manager. The choice of vegetables grown is dictated by the needs of the kitchen, which means that there is a focus on capsicums, carrots, celery, eggplants, leeks, parsnips, pumpkins, sweet potatoes, turnip and zucchini. 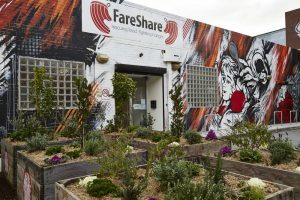 FareShare has written a manual to share their experiences of urban food production. Subjects covered include: crops grown and yield; soil; composting; integrated pest management; crop rotation; and companion planting. Click here to download. The Reservoir site was established in 2015 so that local gardeners with surplus produce have a place where they can easily share it within the community. 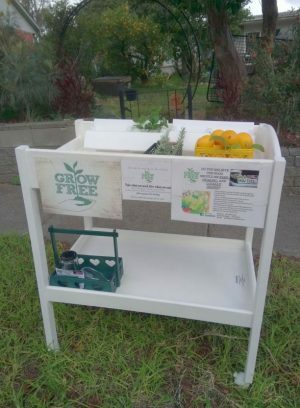 All you need to do to contribute is drop off any surplus home grown food/seeds/seedlings to their sharing crate (on the nature strip) at any time. Please provide a label if it is not obvious what the items are. Note that Food is Free Reservoir is taking a break during the Winter of 2017. People leave surplus fruit, veggies, herbs, seedlings and seeds. Other people may then take them, at no cost. There is no fee, membership, opening hours, or obligation. Donations of garden produce are very welcome, but also small envelopes or ziplock bags, seeds, labels, glass jars for fresh herbs, etc. Everyone is welcome to get involved. The food has all been donated— it’s fresh and free to anybody who needs it. There are gold coin donation boxes to help people feel more comfortable taking the food. 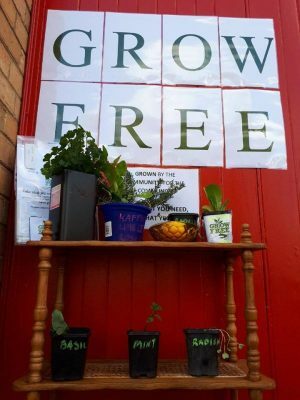 ‘Grow Free’ is a movement “dedicated to making our food locally grown, organic and free” and they are currently” all about growing and giving away free organic, heirloom veggie/herb/flower seedlings for people to get their garden going“. The movement started out in Adelaide but is now coming to Melbourne. Reservoir Community Pantry is simply an open cupboard fixed to the outside wall of Reservoir Neighbourhood House to which people can either donate, or freely take out, any non-perishable food. In practice, most of the food is bought from a local supermarket using a local, grant. It appears that most of the food is taken within a few hours of being placed there. In response, although the Neighbourhood House staff buy most of the produce on a Monday morning, they spread out the timing of its placement in the pantry. Anyone can take anything that they want whenever they want and they don’t need to interact with the Neighbourhood House staff to do so. On Mondays and Thursdays, the Neighbourhood House also gives away free bread (some of which comes from Watsonia Neighbourhood House). In addition, on Mondays, there is free soup. And, finally, there is a free monthly lunch on the 4th Wednesday of every month, midday-1pm. 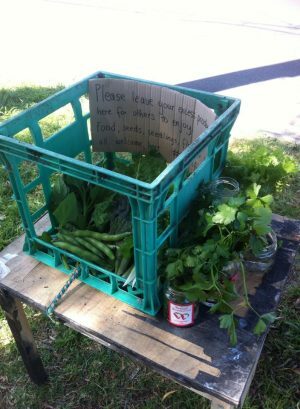 Watsonia Neighbourhood House gives away fruit, vegetables and bread. You simply walk in and take whatever you want. Bring your own bag. The bread comes from Bakers Delight in St Helena. It is collected every Wednesday evening and made available on Thursday (and Friday, if there is any left). Some of the bread is also sent to Reservoir Neighbourhood House for them to give away. The fruit and vegetables come from Monty Fresh in Montmorency. The timing is unpredictable so availability is advertised on Watsonia Neighbourhood House’s Facebook page. 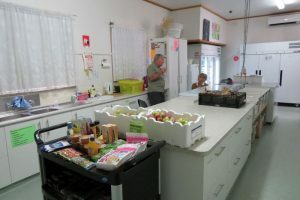 The neighbourhood house is also a drop off point for Diamond Valley Food Share, a voluntary organisation which ensures that emergency food parcels are available to needy people in the municipality of Banyule. Donations of food are collected each week. Finally, the neighbourhood house holds sustainable living and gardening workshops on the second Wednesday of each month, 7pm-9pm where someone presents on such topics as as zero waste, worm farms, keeping backyard chickens, natural soil management, responsible weed control, composting and sustainable garden design.